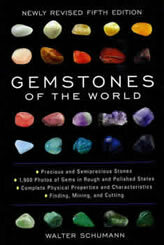 Gemstones of the World is one of the most popular books ever written about gems and gem materials. Over one million copies have been sold. The book contains 320 pages. About 1/3 of them contain basic information about gemstones. The other 2/3 of the pages are dedicated to descriptions and photos of individual gems and gem materials. It includes photos of 1900 gems in rough and polished states. Written for high school level and up. Newly revised fifth edition.